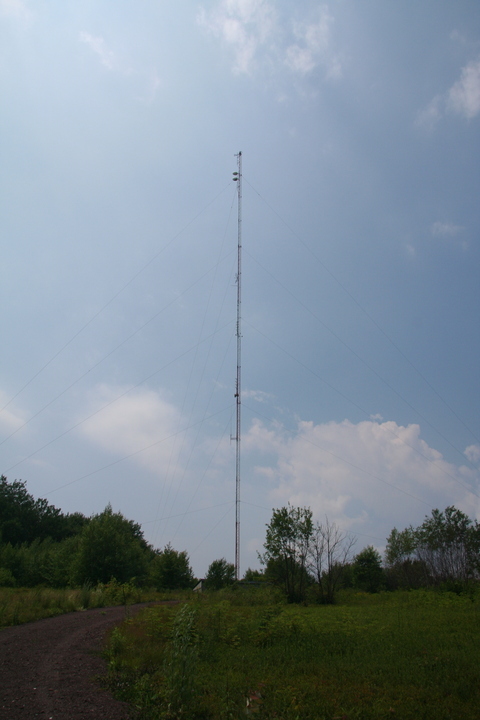 From downtown Greenfield I headed briefly (only a 90-minute excursion due to bad maps, thanks DeLorme) up to Frizzell Hill in Leyden, where WPVQ (95.3A Greenfield) has its tower. This facility was originally built by Ed Skutnik for his WRSI, Greenfield's cool local AAA station; in 1996, Skutnik sold the station to Dynacom (later Vox). After Vox bought country WPVQ (93.9A Turners Falls), the two swapped formats. Both stations now belong to Saga, along with the only other local FM, WHAI (98.3A Greenfield).